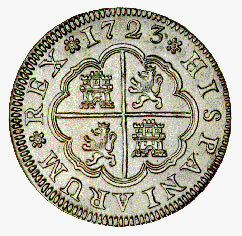 The pistareen, a silver coin struck in Spain between 1707 and 1771, was first issued by the rival claimants to the throne during the Spanish Wars of Succession (1701-1713). This coin provided much of the small change in the British Colonies of the West Indies until 1825 and was also used extensively in Canada and the United States until the early part of the 19th century. Initially the pistareen was valued at 2 reales or 1/4 part of an 8-reale piece (Spanish dollar), but because it had a reduced silver content it was accepted only as one-fifth of the 8-reale piece. Unpopular in Spain, the pistareen rapidly found its way to the New World where coins were in short supply and there was always a great need for small change.